Dermabrasion is a procedure to improve the look of the skin involving the mechanical removal of the damaged top layer using a high speed rotary wheel. Originally developed as a means of treating acne scars, dermabrasion can be used to treat many kinds of skin problems including scars from other types of wounds, wrinkles, skin coloration abnormalities, and other more serious conditions such as rhinophyma, a disfiguring form of rosacea that affects the nose. Although the treatment is not a cure, in that the scar or other abnormality cannot be entirely removed, dermabrasion does soften the edges of the scar or other abnormality and can radically improve its appearance. Dermabrasion is often used in combination with other plastic surgery techniques, such as chemical peels, excisions, punch grafting, and CO 2 laser resurfacing to achieve an overall smoothing of various skin abnormalities, particularly of the face. Dermabrasion is a technique that has been used in dermatology for over 100 years. Although used much less often since the advent of laser resurfacing, dermabrasion continues to be a viable treatment that has been reported to have quicker healing times, similar rates of complications, and is more effective in eliminating some types of lesions, particularly surgical scars. According to the American Society for Aesthetic Plastic Surgery, there were about 60,000 dermabrasion procedures performed in 2001. Dermabrasion is commonly performed using a handheld engine that can reach rotational speeds of 18,000–35,000 rpm. Rapid planing of the skin is achieved through the combination of this rotational speed, the abrading attachment, and pressure applied by the operator. Because of the importance of the skill of the operator, patients should select doctors with significant experience with the procedure. to its surface. Cylinder and pear-shaped diamond fraises are also used for work in various locations. The wire brush is a wheel with wires attached at various angles. In experienced hands, it is the most effective attachment for deep scars. The serrated wheel or diamond fraise is often used to soften the edges of skin removed with a wire brush. Before the procedure begins, medication is often given to relax the patient and reduce pain. For small areas, local anaesthetic nerve blocks are often used to numb the area being treated. Alternatively, topical cryoanaesthesia (numbing the skin using cold) can be used. This is done by spraying a cold-inducing agent on the skin. Sometimes the skin is pre-chilled with ice to increase the anaesthetic effect. During the procedure the patient lies on his back on the surgical table, eyes covered with disposable eye patches. The area being treated is parted with Gentaian violet, a stain that will help gauge how deep the treatment is going. A gloved and gowned assistant holds the skin taut while each section of the face is abraded using the hand-held engine. The surgeon works in sections to avoid obvious lines of demarcation in the final results. If the entire face is to be dermabraded, laser is commonly used for the lower eyelids and lip as less than satisfactory results often occur in these areas. Because there are several different skin surfacing techniques now available, the initial meetings with the dermatological or plastic surgeon must ensure that dermabrasion is the technique of choice for the particular skin abnormality and location that is being treated. Although controversial, some studies have reported abnormal scarring in patients previously treated with 13 cisretinoic acid (Accutane), so many surgeons will require a six month break from the medication before performing dermabrasion. A second contraindication for dermabrasion is HIV or hepatitis infection, as small droplets of blood becomes aerosolized (distributed within the air) during the treatment, creating a risk for the doctor and other staff. Finally, even if there is no patient history of cold sores, it is important that anti-viral medicine is administered to anyone undergoing the procedure, as an outbreak after dermabrasion can be very severe and spread beyond the mouth to other areas of the face. After the procedure, any treated areas are dressed for healing. For example, a dressing that is primarily water held on a mesh support, called Vigilon, can be used to cover the wound. It is changed daily for about five days, then the wound is left open to the air. This kind of treatment speeds the restoration of the epithelium, the cellular covering of the body. Using this technique, healing occurs in about five to seven days. Generally, the patient is given pain medication, antibiotics , and anti-swelling medication during recovery. Antiviral drugs are also continued. Patients should avoid the sun during the healing process. The most common complication of the procedure is the formation of keloid, a type of abnormal scar that results from excessive collagen production. Because this type of scarring tends to be associated with darker skin types, patients with this kind of skin should approach dermabrasion with caution. Other potential complications include abnormal pigmentation of the treated skin, persistent redness of the skin, and a localized dilation of small groups of blood vessels called telangiectasia. Finally, the formation of milia, bumps that form due to obstruction of the sweat glands, although this can be treated after healing with retinoic acid. Normal results include significant improvement in the appearance of the skin's surface after healing of the skin. It should be emphasized, however, that many scars will not be completely removed and the change in appearance is to due a softening of the edges of the abnormality, not elimination. If a patient cannot tolerate a residual presence of the scar or other abnormality, the treatment should not be used. The morbidity and mortality rate of this cosmetic procedure is extremely low. A variety of other skin resurfacing techniques are available and include chemical (phenol or trichloroacetic acid, TCA) peels and laser (CO 2 and Erbium) resurfacing. See also Laser skin resurfacing . Stuzin, James M., Thomas J. Baker, and Tracy M. Baker. "Treatment of Photoaging: Facial Chemical Peeling." In Plastic Surgery: Indications, Operations, and Outcomes. Vol. 5, edited by Craig A. Vander Kolk, et al. St. Louis: Mosby, 2000. Roenigk, Henry H. "Dermabrasion: State of the Art 2002." 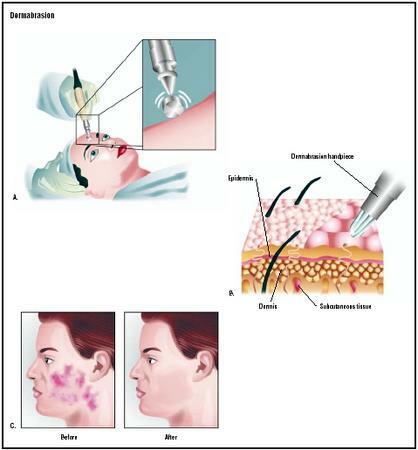 Journal of Cosmetic Dermatology 1 (2002): 72–87. This procedure should be performed by a dermatological or plastic surgeon with experience in dermabrasion. It is done in an outpatient suite. Hospitalization is not required. What characteristics of my skin abnormality suggest using dermabrasion to treat it? Would laser or chemical treatments be an option? What is the expected cosmetic outcome for the treatment in my case? Thank you! I am thinking about getting dermabrasion on my face where I have a scar. I already went to my consultation and this was great information before I actually go through with the procedure. You May Go To The Hardware Store And Purchase Course Sandpaperfor Less Than 5 Dollars And Try Doing It Yourself. I Saved 2,500 Dollars And The Risk You Have To Take Going Under! My Skin Did Bleed And I Kept It Clean. The Skin Crusted Over And Has Up To This Day Almost Completly Healed. I Did The Work On My Skin 3 Days Ago And My Skin Surface Looks Great. I'm thinking of having dermabrasion around my mouth due to smoking the past I have lines that I want to deminish. I just wonder what the best thing to do for aftercare. So people say just to do nothing and let it scab and heal on it's own while others say to stop it from scabbing. Do you have any ideas on this? Response to No. 3 - Amber Adams. Hi Amber, I just had this exact thing done 10 days ago as part of a neck lift procedure. After surgery my bandages were removed and I wasn't given anything to cover my mouth and chin area which was absolutely red raw and very sore. I was told by my ps to just use Vaseline when it got too dry, which led me to slathering my lower face in it. I too have read that dressings are used for the first few days - others say you should keep the area clean and dry. I think my treatment so far has been very poor as I was not told to clean the skin at least 5 times a day which you should do .. even from day 1 - to be honest I was so scared of touching it for the first two days (one of those was in hospital) I didn't even touch it. When I tried to put some Vaseline on it the second day a nurse told me not to touch it until I'd seen the ps, who then didn't give me any advise on cleaning my skin. Anyway, after I got home I looked up dermabrasion and apparently to give it the best chance of healing you need to wash it 5 times a day .. RIGHT FROM THE START - and don't grease up with Vaseline like I did, just use it sparingly if your face starts to crack. Also you can use 1 part vinegar to 5 parts water in your sink and lower your face into the water for a good soak. After I started doing this my face started to improve very quickly I am now on day 10 with an appointment tomorrow to have my stitches taken out and my face is still so pink anyone can tell I've had this done -I am really scared at the moment that I am going to be left like this forever. If you are not having this done as part of a surgical procedure I would suggest having it done as a course of treatment, much better to deal with I think. I am a 43 year old woman and I have been unhappy with the way my face looks lately. I used to sunbathe in my teens and the sun took a toll on my skin. After reading and educating myself on dermabrasion I feel that this procedure would be the best for my problems. I have dark spots, some wrinkles, uneven skin tone and I didn't know what to do. I am so happy to have read through all this information. I am going to look into a doctor in my area and schedule an appointment. Thank you very much you have helped me enormously. I have already spoke to a plastic surgeon, what I need is to see the procedure done, can't find it anywhere, everything but that. (full dermabrasion).I'm so scared.